peace » Zamboanga-Basilan Integrated Development Alliance, Inc.
“We continue taking shared steps in our journey to peace. We make special mention of this year’s events highlighted by the violence in Marawi and the separate explosions in Maguindanao, Basilan, Sulu and other places in Mindanao. This is also a year that gives place to the search for peaceful alternatives to local conflict such as the Enhanced Bangsamoro Basic Law, the issue of Federalism, and other approaches that mean to address our historical differences. 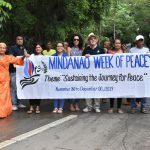 Added to that is the on-going war on drugs, poverty, and corruption,” the Interreligious Solidarity for Peace stated as it officially opened the Mindanao Week of Peace 2017. The observance of the Week of Peace started in 1997 as initiated by Peace Advocates Zamboanga (PAZ) and the SALAAM Foundation Inc., and later on by the Interreligious Solidarity Movement for Peace which turned into a Mindanao Wide-celebration then providentially declared through Presidential Proclamation No. 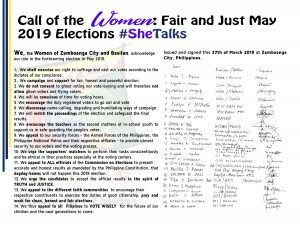 127, series of 2001 under the administration of former President Gloria Macapagal-Arroyo. This has been nationally celebrated through the Mindanao Peace Weaver Networks. For 20 years now, the Mindanao Week of Peace celebration gathers diverse group of people beyond cultural and political differences participating in various activities such as a Grand Peace Parade (Opening Parade) and Grand Parade of Lights/Torch Parade (Closing Parade). Majority of the activities of the Mindanao Week of Peace 2017 still brought together people from different sectors. 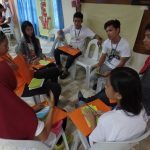 From November 21 to 23, PAZ organized a Regional Peace Forum gathering around 65 Youth from Schools, Peace Clubs, Student Government, and Youth Sector Representatives from Barangays. Part of the Mindanao Week of Peace 2017 Celebration is the recognition of the Peace Weavers Awardees wherein Peace Builders who has shown and/or given outstanding efforts towards the achieving Peace and Solidarity in Mindanao are nominated and are chosen from. For this year, Peace Weaver Awardees 2017 are Professor Noor Mohammad-Saada of the Academe, Lt. Gen. Carlito G Galvez, Jr. of the Security Sector, Dr. Aboulkhair Tarason of the Religious Sector, Mrs. Juanita M Cabugatan of the Women Sector and Mr. Nulhamdo Cegales of the Indigenous People Sector. Anchoring on this year’s theme of the Mindanao Week of Peace “Sustaining the Journey for Peace” some 60 Christian and Muslim youth leaders from Zamboanga City and Basilan Province had a three-day journey during the Regional Youth Peace Forum conducted last November 21-23 at Our Lady of the Pilar Retreat House, Mercedes this city. 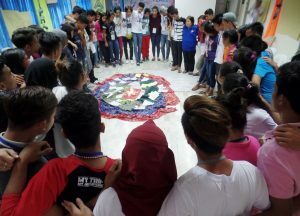 The Regional Youth Peace Forum is a yearly joined activity of Peace Advocates Zamboanga (PAZ), Interreligious Solidarity for Peace (ISP), Youth Solidarity for Peace (YSP) and the Zamboanga Basilan Integrated Development Alliance (ZABIDA) which aims to gather the youth leaders from this city and the neighboring island province to Basilan to discuss the current issues that are affecting these two culturally diverse communities especially the youth sectors. 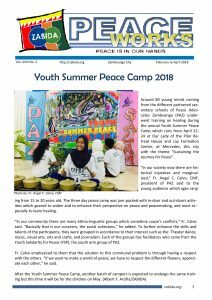 “For this year the activity aims to discuss relevant societal issues affecting the young generation and their roles as peacebuilding and to undergo the initial sessions on healing for personal and social transformation by using the concept of peace tables,” Rosie France M. Montojo, PAZ Project Coordinator said. Miriam L. Suacito, the Executive Director of the Nagdilaab Foundation (NFI) a Basilan based non-government organization and a member consortium of ZABIDA was the led facilitator of the three-day stay in the healing session. She brought the youthful participants who are coming from the school organizations and community-based organizations into the deeper understanding of Trauma and Healing. During her series of sessions with them, she underscored the different types of trauma that the youth now days are encountering such as the sexual and physical abuses, bullying and emotional abuses. She also presented mechanism how to go over with the pains and trauma and to formally be healed. This year the Mindanao Week of Peace is on its 20th-anniversary celebration and it is putting more emphasizing on the need to continue the journey towards the just and lasting peace amid unending violence in Mindanao. With the observable weather changes and frequent natural disasters happening in the country and, Zamboanga City having its coastal barangays, ZABIDA is taking its initiative to proactively conduct environmental programs. One of which is a Participatory Coastal Resource Activity in Simariki. Simariki is an Island that is part of Barangay Talon – Talon. It is inhabited by Sama Banguingui Tribe led by Simariki Island Sama Banguingui Association(SISBA). 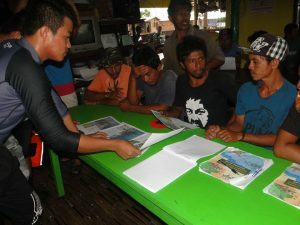 The people in the area get their source of living from the bounties of the sea through either fishing or seaweed planting. During the Zamboanga Siege in 2013, the people in Simariki were forced to leave the place because of the chaos. Now, that the situation is restored to normal, SISBA together with the aid coming from ZABIDA and Verde Zamboanga Alliance represented by Ms. Cellyn Aron Verallo ADZU Faculty staff and the activity’s lead researcher, assisted the community to assess their own socio – demographic as well as the biophysical resources of the area so that they will be able to determine the status of their resources.